Try using Instructional Dialogs as a quick and easy electronic portfolio for student work. 1. 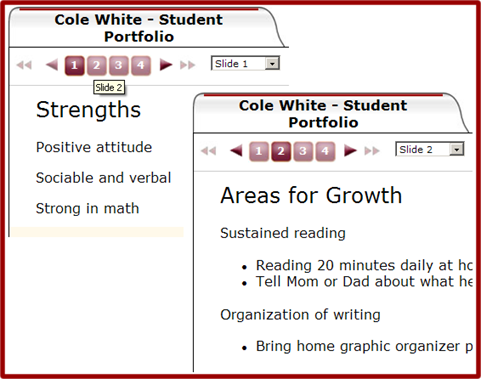 Create a template for a student portfolio by creating a new Instructional Dialog. 2. Label each slide with a specific topic (e.g., Writing Samples, Multi-Test Reports, Strengths, Areas of Improvement). 3. Once the template is complete, copy the template for each student and put each student’s name in the title of one of the copies. 4. As the year progresses, use the edit resource to add student projects, presentations, writing samples, report cards, teacher notes, even videos created in the classroom). 5. At conference time, click on the view to preview and present parents with a multi-media snapshot of what is really happening in the classroom and student progress. This tool makes sense for electronic portfolios as it is extremely flexible, and it may be customized for each student as needed (e.g., IEP information, reteaching strategies implemented). Also, slides/categories may be added as the year moves forward. In addition, students who remain in the school system for consecutive years can place each year’s portfolio into a Dialog Book. Upon graduation, both the school and its students will have a powerful electronic record showing their hard work and progress across multiple years. What Makes An Engaging Multimedia Presentation?